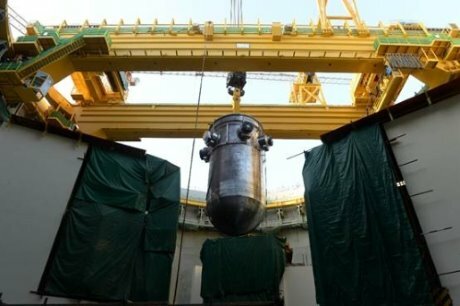 The reactor pressure vessel (RPV) has been hoisted into place at Karachi unit 2 in Pakistan. All of the main reactor components - the RPV and three steam generators - have now been installed at the Chinese-designed Hualong One unit. The operation to lift the RPV into place was completed on 30 September, China National Nuclear Corporation (CNNC) said yesterday. Lifting of the four main components took just under three weeks to complete, starting with the installation of the first steam generator on 10 September. The operation marks the first time that a "pre-introduction" construction method - with the main reactor equipment installed before the dome of the containment building is put in place - has been employed in this type of nuclear power plant, CNNC said. This approach can significantly reduce construction time, compared with the traditional method of installing equipment through a hatch in the containment. Two Hualong One units are under construction at Karachi. Work began on unit 2 in 2015 and unit 3 in 2016, with commercial operation planned for 2021 and 2022, respectively. The units are the first export of the Hualong One pressurised water reactor design, which is also being promoted for use at the Bradwell site in the UK. A single unit pressurised heavy water reactor, Karachi 1, has been in operation at the site since 1972.